will be a great addition to a rainforest unit and are sure to become class favorites. This book, written in the style of The House That Jack Built, has beautiful, detailed illustrations that your students will love. The repetitive text will introduce students to a variety of rainforest plants and animals and demonstrates how living in the rainforest links them together. This rhyming book is a perfect choice for reading aloud. It's text and illustrations focus on the sounds and sights of the rainforest. Use it to introduce a lesson on writing a rainforest poem. The Umbrella is about a boy who ventures into the rainforest to find some animals. When he leaves his umbrella on the ground to climb a tree for a better view, the umbrella becomes a resting spot for a host of rainforest animals. One by one they enter the umbrella and the animals make room for each new visitor. Students who have read Jan Brett's The Mitten will know where the story is headed, but they will enjoy it anyway. Use The Mitten and The Umbrella for a lesson on text-to-text connections or teach your students how to complete a Venn diagram. Your students will love this colorful alphabet book that was written and illustrated by a high school student. It is another great introduction to the plants and animals of the rainforest and would make a good springboard for writing a class alphabet book about the rainforests. Spend a night in the rainforest with a red-eyed tree frog as he avoids predators and looks for food. The simple text and close-up photographs of the animals of the rainforest make this book a perfect choice for younger children. Eric Carle's picture books are always favorites with children. In this charming story the sloth climbs, eats and even sleeps slowly, slowly, slowly. As the other rainforest animals question his slow ways, they learn an important lesson about slowing down and not being in such a rush all the time. A forward by Jane Goodall gives some interesting information about sloths. The predictable text and strong picture support make the big book version a good choice for shared reading. This counting book is another variation of the classic song "Over in the Meadow." It spotlights a variety of rainforest animals and their habitats. It also describes the layers of the rainforest, so it makes a great book to read when reviewing the four layers. Use it to go along with a rainforest themed math lesson or just as a read aloud. Either way it makes a great addition to your rainforest unit. You can find all of these rainforest unit books and others at Amazon. Use these lessons to plan a rainforest thematic unit. These plans are appropriate for first and second grade students. 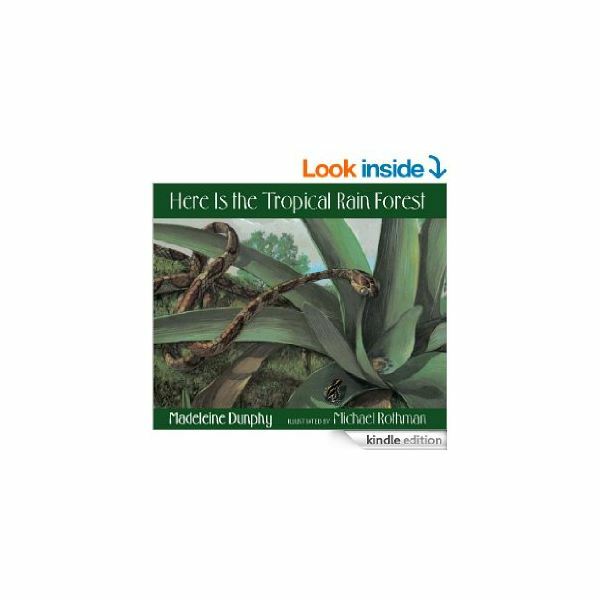 You’ll find lessons on the plants and animals of the rainforest, rainforest layers and locations, and rainforest resources, as well as books to use during your unit.